Unrelated grainy screenshots of a different ride, when it was still cold enough for quarter sheets. As I briefly mentioned in a previous post, I signed Dino and myself up for our first show of the year this weekend, which also happens to be our first show in nearly an entire year, since we only showed once in June of 2018. 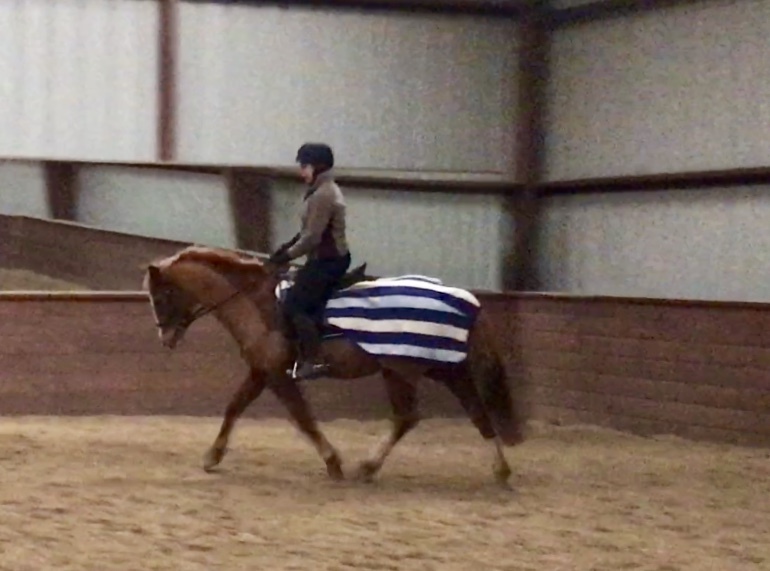 Mid-April is definitely EARLY for us when it comes to starting the show season, but having had the indoor to ride in all winter, I'm feeling mildly more prepared than I would otherwise. But despite being in relatively good shape for early spring, I'm still not brimming with confidence that we'll knock it out of the park our first time out this year. Preparation has been lacking in comparison to my usual obsessive levels of practice before a competition. I have ridden the 2019 First Level Test 1 exactly once without forgetting a movement. I have had exactly one lesson since December. I rode my horse exactly twice last week. This is... not how this process usually goes for me, and it's making me a little nervous. I did spend some time yesterday riding through the test a couple times, since the more on "auto pilot" I can be as far as the movements and order of the test, the more relaxed and focused on the actual riding part I can be. Going down centerline hoping I'll remember everything is also not my idea of a good time. Overall, when I stopped forgetting entire changes of direction, the test happened. We did the movements, they happened more or less where they were supposed to, and Dino stayed on the bit. There were great moments, like the canter lengthenings, (never thought I'd say that!) and not-so-great moments, like the medium walk to trot transition, which I inadvertently shut down by pretending I was a statue in the saddle. I know everything will be better if I can just relax and RIDE, but that's easier said than done. While thinking over the test, I also realized that just doing a bit less will go a long way towards smoothing things out. Dino is, ya know, trained now, and I don't have to make such huge over-corrections in his straightness or tempo. During our practice test, I found that he was actually very reactive to the aids and I was saying WAY TOO MUCH at any one moment in time, making him wiggle and fuss and lose energy and swing trying to "keep" him where I wanted him. A little more trust and a little less frantic aiding will help us, I think. 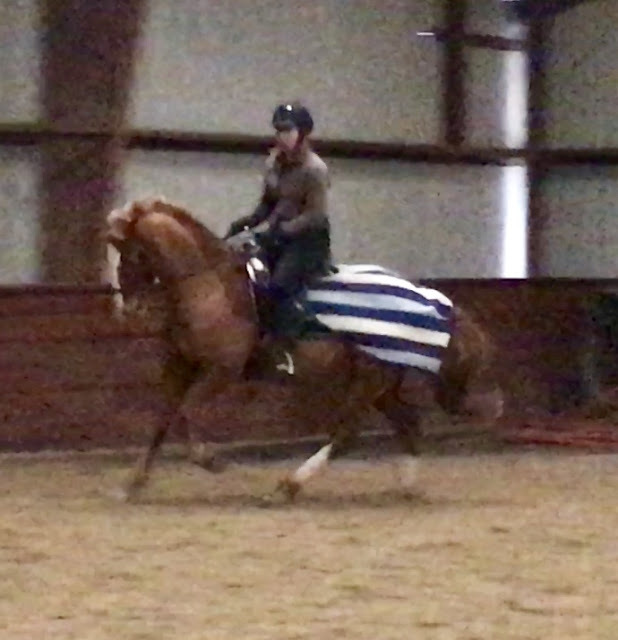 Over text later, my trainer also suggested trying the Centered Riding concept of "soft eyes" (softening your gaze so you don't hyper-focus on one point and shut down your peripheral vision) to TIME TRAVEL to the next movement in my head before it happens. I am all. about. that, and am eager to test out the concept. Perhaps all I need for a great test is a TARDIS? I think you're going to be more prepared than you expect. Just getting to ride throughout the winter is a huge help! Good luck, can't wait to read all about it! I know you will be fine and Dino too. Can't to see how you do!! Keep on riding! !